The black Lite-441 DL Shoulder Bag for a DSLR with Zoom Lens or Camcorder in shooting position from Kata is slightly larger than the Lite-439 DL but is still a compact way to carry around your photo or video gear. This is a no-frills bag with enough space for your DSLR, 2-3 small lenses, flash and a few small accessories such as batteries and memory cards. A rear zippered pocket is also available for personals and other small accessories. The exterior is made from a durable combination of 75% Ripstop nylon and 25% regular nylon. The inside features Kata's bright yellow padded fabric and dividers that both protect your gear and make it easier to locate when shooting in lower light scenarios. Inside the top lid is an organizer pocket for the small stuff such as media cards and batteries. The bag offers three carrying options. The included Elasto-Guard shoulder strap is adjustable and removable. Once removed, you can use the handy belt loops for hands free traveling. The top carry handle is unique in that it is designed to run perpendicular to the rest of the bag. This kind of design gives the bag a thin profile while walking. Easy throw dual zippers open the front flap. When the weather turns against you, use the included rain cover to protect your gear from the elements. 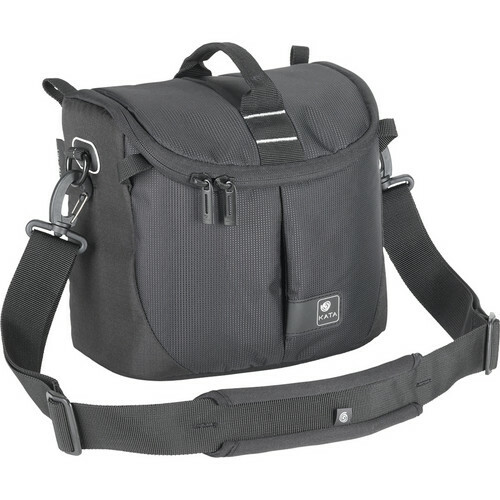 Box Dimensions (LxWxH) 10.7 x 9.3 x 6.6"
Lite-441 DL Shoulder Bag for a DSLR with Zoom Lens or Camcorder (Black) is rated 4.4 out of 5 by 34. Rated 4 out of 5 by Ken J. from NOTHING'S PERFECT BUT THIS WORKS FOR ME As my headline suggests, don't take the 4-star rating as a put-down. The Kata Lite-441 DL seems to be well thought out and constructed, as are most of that company's products. It's small but just the right size to carry my Nikon D-3300 with its 18-140mm zoom lens attached, stored with the lens up (the supports aren't strong enough to keep the lens suspended). The pockets are sufficiently big enough to handle the much appreciated water-resistant cover that Kata provides plus an extra camera battery, spare SD cards and some basic cleaning equipment. I'm also able to squeeze in my SB-400 external flash and HB-69 lens hood. These are all I need most of the time. I shoot a lot of stage pageants and I also like to take nature photos. This bag has me covered either way. Sure, there are times when I need a full-size one, but this is quickly becoming my go-to bag. Rated 4 out of 5 by That Guy from Nice Day Bag Decent size, decent quality. Purchased primarily because it was the deal of the day and I thought I might be able to use it or give it away to a family member. Rated 5 out of 5 by Hoang Phan from Light weight & great design! Well-made, nice looking case. The tiny-looking makes me think it could not fit to my DSLR bundle (Canon 70D, 1 sigma 85mm 1.4 & 1 Sigma 17-50mm) Surprisily it fits so well; moreover, i can put some other small stuffs. Much better than my previous case from Canon! So happy with the purchase! Rated 3 out of 5 by Greg from It's OK, not a Tamarac though. It's replacing an old Tamrac bag that has started to shed material coatings in pockets. It's not made as well, the material isn't very heavy, but it's holding some 4/3 stuff that needs a small bag. I really like bags that have a top flap - over cover that keeps out weather, this doesn't, it has a top edge zipper that is at least mostly covered with material, but not the rubberized type. I think I may like using it as a belt bag though, that's something I haven't had in a small bag before, and it could work like that for some other gear during run&gun. For what this cost on the special, I think it was all of $, I shouldn't be complaining, it was an impulse bag. I really like Cinebags, and most of the bags that my rental house has are pretty nice, just a bit on the high side in cost. Rated 4 out of 5 by Denden K. from When you want to go lite! I use this bag for my Nikon D7100 with Nikkor 17-55. It has the right amount of snug fit. There's also room for my Nikon SB-700 flash. There's also a net pocket between the yellow padding and the bag front for small accessories like memory cards, lens cloth, etc. It's perfect for my needs and I'd have given it 5 stars except that I don't know how durable the strap clips are. I like its "slim" profile compared to my bulky Nikon bag. Rated 4 out of 5 by Learner from Great for mirrorless camera system I bought this to hold my Nikon V1 + 2 prime lenses + 1 telezoom AND an Olympus EM10 + 2 primes + 2 zooms. They all fit in the main compartment with just one separator. The other pockets are for batteries, extra cards and filters. Quality is good. Only downside is it's rather bulky because of boxy design, unlike others which are more tapered in design. Rated 5 out of 5 by Photo Nut from It's Perfect for Me Perfect size for my camera, a spare Memory Card, Lens Hood, spare lens. The best part, it can be worn with a belt on my hip, and the shoulder strap fits as such too. It's light enough to not be a bother and I've got what I need right with me instead of in the car. Is the strap long enough to be worn across the body? The strap is about 18 inches long, fully collapsed,and about 27 inches long, fully extended. . This islong enough for a 6 foot 245 lb. man -- me. . My armjust rests on the top of the bag when fully extended. Answered by: john p m.
i'd like to use this bag to carry a D700 or D750 with the Nikon 24-70 f2.8. Is this bag deep enough? Asked by: Lawrence G S.